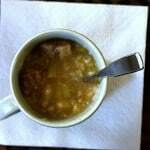 You reach for soup when you are sick, when you just cannot get warm, when you need to slim down or even save money. A soup can take on the flavor-of-the-moment or evoke childhood memories in its classic form. But if you have never looked to soup for something to keep hunger at bay, you are truly missing out. The simmering process renders the heartiest ingredients soft and sippable while giving your whole body that warm hug only a good bowl of soup can give. Ready to trade in high-fiber snacks for ones you can slurp? Here are 6 satisfying, filling soup recipes we simply cannot live without. Beyond the myriad of vitamins living within the bright orange flesh of your beloved sweet potatoes, these festive spuds can also help improve blood sugar regulation, which can prevent the sugar crashes that leave you running for the couch and the cookies. 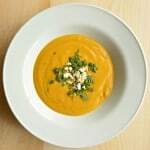 Pureed until thick with curry powder, coconut milk, and tahini, this indulgent soup will warm you to the soul and stick with you all day. 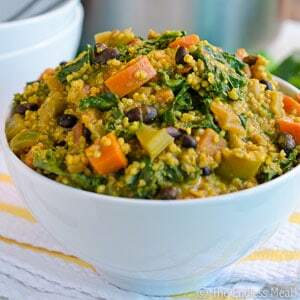 We know, we know—when we’re talking about superfood grains, quinoa is having a moment. But next time you’re in the grain aisle, look to the right or left for the nearest bag of farro, another ancient grain guaranteed to fill you up. 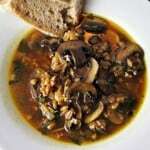 The fiber-filled nutty grain is, along with meaty mushrooms, what gives this savory soup incredibly satisfying. Mmm. It’s not the zing of the fresh ginger, the sweetness of bell pepper, or the nuttiness of quinoa that makes this stew great. It’s the fact that you can pull together a complex, crowd-pleasing stew that will leave you eating pretty for days in just 40 minutes. This crazy filling stew packs 16g of fiber in each serving, so you can hit your afternoon spin class without feeling faint. 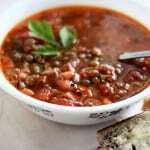 Lentil soup is a classic for a reason—beyond its family friendly flavor profile, lentils are considered one of the healthiest foods you could ever eat. Because they’re dried, these little beans take a fraction of the time to soften up, adding body and velvety texture to every bite. One cup of lentils gives you over 60% of your recommended daily amount of fiber, so you’ll be good to go all day. On a bitter cold day, chowder is like a scarf and gloves for your stomach. 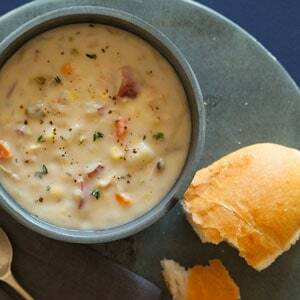 Chunks of potatoes, hearty carrots, leeks, and the addition of starchy corn come together in a thick, creamy broth that hits the side of your belly and stays there. Smoky bacon and clams give this chowder a punch of protein, but you can keep the hearty party going with whatever shellfish or heavy white fish is on sale. 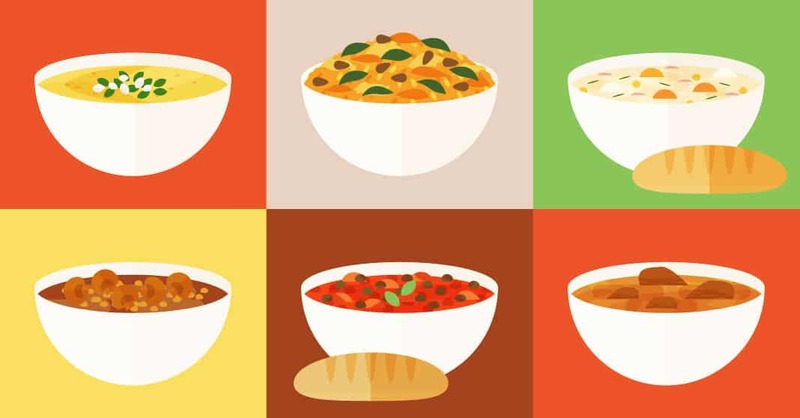 One of the most wonderful things about soup is the inactive preparation—chop and throw your ingredients into a pot, cover with a liquid, and go about your day. And lucky for you, this beef, leek, and barley soup is no exception. The best part? Use this recipe as a vehicle for whatever’s keeping your cabinets too full—beans, peas, corn, etc.—to warm souls and stomachs on a cold winter day.